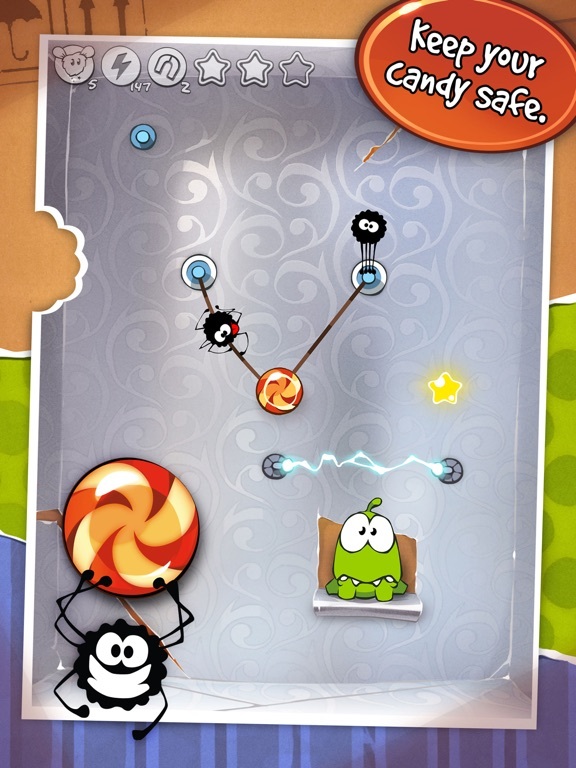 Cut the rope all the way! 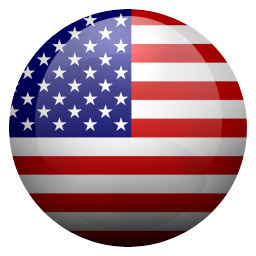 It’s a fun, fast, and free game! This game is okay. I use to play a long time ago and was so happy to see this on the App Store. So downloaded it, and it’s way easier than I remembered haha. But what seems like every other second is an ad it’s frustrating to play. Now I understand you can buy the game for no ads, but I don’t think this game is worth buying it and i understand having some ads in a game but it is definitely not worth keeping when I am constantly getting ads. 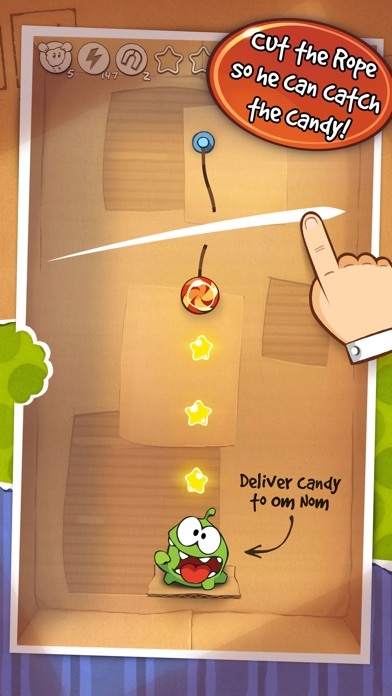 Om Nom is so cute and he loves candy need I say more?...really fun game. Cute, but amount of ads is frustrating. I used to play this game a lot when I was little. A few weeks ago I went on a nostalgia trip for old favourites and I got all the games in this series. I started playing and every time I lost a level, I got intrusive ads you could only skip after 15 seconds. And to force players to pay actual money to stop ads is just greedy. It’s impossible to play one minute straight. Ad videos appear very very often and kill the game. I used to love this game. I bought it for $0.99 when I was a kid and I played it every day. I just re-downloaded it and was sad to see that the developers ruined this game with how many ads there are. I paid for this game a while ago, and now it’s telling me I have to pay again to get rid of the ads. Unless you’re ready to sit through an ad for 30 seconds after every 2 levels, or you’re willing to pay $3 to get rid of the ads, this game isn’t worth downloading anymore. No game is worth 45 second ads that you aren’t able to skip through. Sorry. Love this game ! So fun ! I used to play this game on my moms little iPhone 5 and now I discovered it again it’s definitely changed. But there are so many ads way to many its like after every level there’s an ad. But I love this game so I don’t blame the creators for making money. Nice game except for the incessant ads. They pop up almost every other puzzle. They spoil the fun, and all they do is make you want to delete the game which is what I am about to do. I would gladly pay $2.99 for the game if I didn’t have to deal with the ads. Its very hard on the second season, I am 11 and am good at figuring things out and it's hard for me. Imagine a five year old completing this! Not what it used to be. Nothing to it, it’s just fun! Thank you very much for making this game I LOVE IT! This game was my childhood it is the best game ever better than fortnite for sure. The game is great, but the GAME is what I want to focus on. Not 45-second ads every level or restart, or hints I can’t get out of, or levels that make me use ‘superpowers.’ I want to focus on the game. This game is impossible to play. There are ads every five seconds. A lot of them are 30+ seconds with no exit or skip button. This game was very fun as a kid but I am getting very annoyed with all these ads I have to sit through just to play a level. Cut the rope is a so-so game. I don’t think I’ll plan to come back to the game when I’m old enough because like I told ya it is a so-so game. It is awesome I played it when I was I think 4 Nice work on the “get 1 hint free” and I think 1 hint is enough 1 level but 2 for watching a “video” (a.k.a ad) Good thing 1 I am fine with! It can be an addicting game but after a few levels, there is literally some sort of AD in between each level. You can skip a few right after, but some are 15 seconds long and it’s really annoying. Just going to delete the App now instead of waste my time. Thanks Apple. I used to play this game all the time when it first came out, when I found it was still available I immediately reinstalled it and it’s just as fun as it was ages ago! Would be five stars if it weren’t for ads. 😒. Also it’s changed so much. Kind of a disappointment You’re not getting better just worse. It’s still a great app for the gameplay, but it’s not the same. ADS EVERY GAME, YOU CANT SKIP, YOU CANT LEAVE, YOU’RE FORCED INTO WATCHING A 30 SECOND ANGRY BIRDS AD. NO NO NOOOOOOOOOO, WRONG . ABSOLUTELY TERRIBLE. THE AMOUNT OF ADS SHOULD BE ILLEGAL, YOU’RE TAKING AWAY MIY RIGHTTTSSSSS! Bought the pack which distinctly describes new levels. There aren’t any, and customer support said there won’t be, when I contacted them. Save your money and pass on this latest update, because it’s bait and switch. I love this game!!! So many thing to do and it never gets boring!!!!! 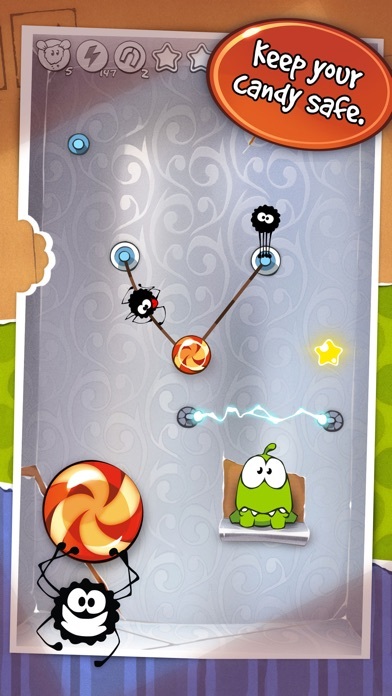 Cut the rope started out fun, but after you passed certain levels the game changed things. It was either a glitch or levels put poorly together. I used to play this game a lot, but it changed. Every three restarts you get an unskipable ad, which is what makes the game long. Though there are a lot of ads now, it’s still a good game, but I suggest dialing it down on the ads. I laughed so hard at this game! This game is definitely one of my favorites! 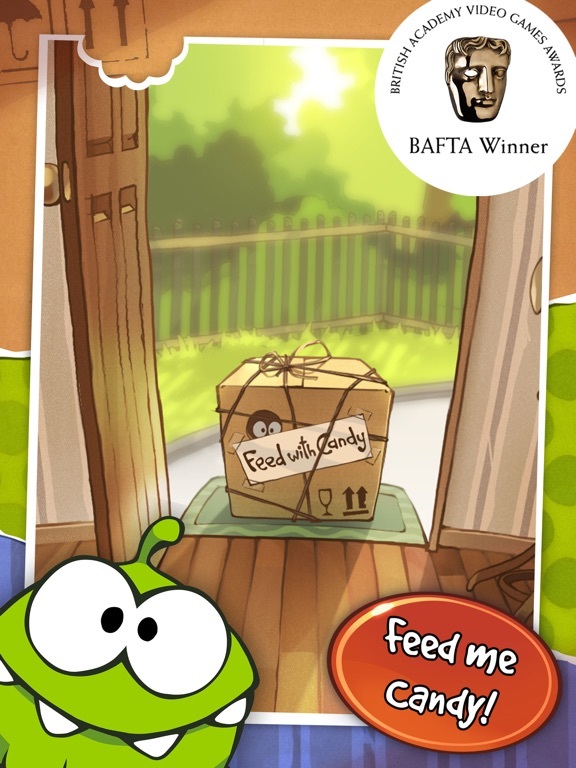 Om nom’s faces are hilarious! Zeptolab doesn’t belong on top anymore, I had so much time invested in the game and one update wiped my cloud save as if it never existed, never doing business with this developer again. This game is adorable and fun but two stars are withheld on account of the stifling amount of ads. I can’t hardly play at all because I have to watch an ad every three seconds! And they’re long ads too! There are so many ads that run for 40 seconds or so that the game is quite literally unplayable. The game is fine I guess. I mean it’s pretty average. But there are an unnecessary amount of ads. I would get multiple ads on just one level. It’s a little ridiculous and it ruins that actually mediocre game. The title said it all. Gameplay, graphics, sounds, music. A perfect game. I love this game so much! The graphics are great and I have had no problems at all. When ever I am bored, I play this game and then I’m not bored. Also it builds your problem solving skills. One of my favorite games! I played this game a while ago, but recently redownloaded it. I was sad to see that it now had ads, but I suppose a company has to make money somehow. This review is still five stars however, as it’s just that good. It’s practically OOZING with charm, and fun gameplay and even a cute story make this one of the best games on mobile! You get 3 tries to do anything. Then an ad. It is so annoying. I love they game and I wanted to replay my iPod years. These ads ruin it. I’ve been playing Cut The Rope for awhile and its not a bad game. But one thing that gets annoying is i get a ton of ads. I know when apps are free they need to have ads. But when you have ads as soon as you open the game and everytime you beat a level it gets annoying. I’m just saying their doesn’t need to be a ridiculous number of ads. No annoying ads, the character is cute. The idea is cool. This game is so cute and addicting.I can’t stop playing this! I love it 🥰 it’s so fun!!!!!!! I totally recommended this!!!!!!!!! Isn’t there an ad-free version?? This used to be a great game, started playing after several years off, but now it is impossible to enjoy because of the frequent and intrusive ads that you can’t get out of. I don’t remember this from before. It’s not worth playing because of the number of ads. Shame, because it was a great game once! An app has never brought me so much joy. I love this little monster. i get u need money to run it but this is just ridiculous. stop forcing hints on me. if i wanted one, i’d get it. i’m just trying to get the stars. also what’s with the drawings? i don’t remember those and they don’t serve a purpose. When I upgraded to an iPhone I figured it would be neat to re-download all the old apps I had on my iPod touch that I played when I was in middle and high school. This was a personal favorite of mine. The game was addicting and fun to play, and was just adorable in general. The fun gameplay hasn’t changed much aside from the addition of “superpowers” (which I don’t use to begin with), it’s still as adorable as I remember, but I find myself playing this without my WiFi or mobile data on for what is obviously the biggest change. Ads Lots and lots of ads. I don’t like the addition of obnoxiously intrusive ads, and I’d like to emphasize intrusive because I had a 30 I skip panel second video shoved in my face while trying to restart a level. I have to play this game with any network connections off or else I’ll be forced into watching videos for things I don’t care about. Don’t get me wrong, there’s still ads with internet off, but they’re far less disruptive than the videos. The addition of micro transactions is also upsetting as superpowers add nothing fun or useful to the game since levels were easily solve-able on their own and any level you couldn’t pass required some trial and error. Now, like most other games, you can plop down a dollar and get past it. I’ll still be playing the game for the nostalgia and fun, but I feel the recent additions to the game are disheartening and greedy. 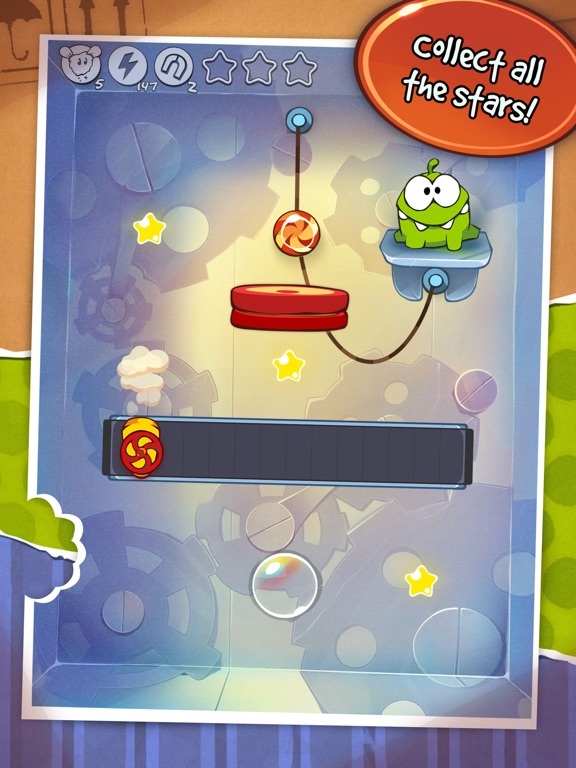 Cut the rope is a great game, but there are too many ads. This game also crashes a lot. The ads are long, and unskippable. I have noticed that a lot of people have been saying, just from the first few reviews, that there are too many ads and it crashes to much. I have a feeling you guys just don't bother to fix any of these problems ever. I say this because some of these reviews are from almost 15 years before I was born! And almost all of them say the same thing: TOO MANY ADS or CRASHES TOO MUCH. I would like you to, and many other people too, fix these problems. You make more money when more people play your game then when you show ads. And you LOSE more people who play your game, by NOT fixing problems. Hello, I have completed Cut the Rope with three stars on every level, so I have nothing left to do! So I got an idea for people to make their own levels. 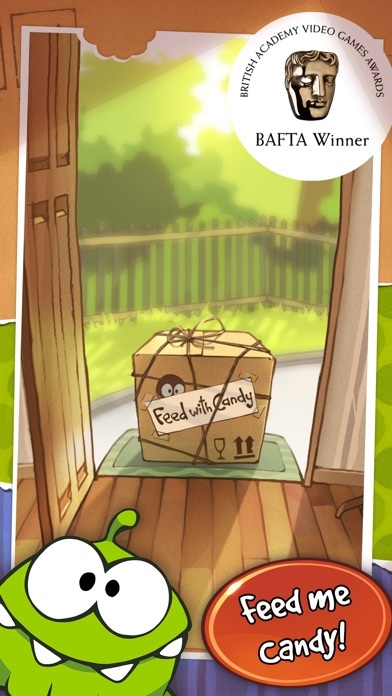 Like, when you complete a box, you unlock whatever the thing used to transport the candy to the monster, and can use the tools to make custom levels and share them for anyone to play. And also, for the people complaining, here are solutions, turn on airplane mode to turn off ads. Three star all the levels in chapter 1 to unlock chapter 2. Three star both of those chapters to unlock chapter 3. You really don’t have to pay $3 to finish the game. THERE YA GO. Hope this helped you. Welp, until next time! Bubye! The game design is fun and great, you beat levels to help Santa. The levels are well planned out and are challenging but fun. My only complaint about this game are all of the adds. Once you play a level twice it gives you an add. The adds are annoying so I close out of the app and reload the game. But most levels take 3-4 tries on each level so you get about 2, 30 second adds a level. 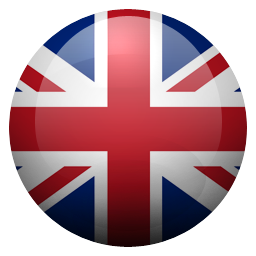 I have no other troubles with the game, everything in the game is well done by the game designers and the thought of this app is terrific. But it’s just the adds that annoy me and probably other users too. But overall a very fun and enjoyable game. When I was much younger, Cut The Rope was one of my favorite games, now as an adult, I downloaded the game again to feel the same joy I used to get from playing many years ago. Thankfully the game itself has remained the same, the levels are the same, and the basic function is the same; however, the adds for this game are absolutely ridiculous and make me want to delete the game all together. I understand a couple of pop up ads, or every once in a while a longer 15-30 second, but after almost every level/action you make in the game, there is a long 30-60 second add that you CANNOT get out of. It’s frustrating. I shouldn’t be forced to pay 2.99 to remove these ads especially when I’m going to finish all the levels so fast. I used to have this game several years back, and it was awesome. When I saw it on the App Store and downloaded it, I was excited to play it again. Unfortunately, the ads and up-sell suggestions have completely ruined what used to be a great gaming experience. I don’t mind some advertising and suggestive up-selling, but when it occurs every few levels or attempts at a level (in a game where levels take little time to complete, at least early in the game), it becomes annoying enough to make me delete the app and write this (my first review of an app on the App Store, by the way). If the ads were on an internal timer where they couldn’t occur fewer than X minutes apart, that would perhaps make it bearable. Until then, I’m out. On this game and any others that come from this maker. This game gets almost four stars because it lacks replayability and has an over-monetization problem. The game isn't happy with the money you pay for the full version, they have to hawk you every sixty seconds with advertising to spend more. That makes it unplayable for kids for sure because they get stuck on advertising screens. Makes it insanely annoying for adults. Also, the boards are fun but not really replayability (like Angry Birds puzzles for example) because there's a risk of getting a lower score and having your higher score wiped away. No bueno to not keep the highest score on the chart at all times. They are just too fetch four stars. Guys, you just turned one of the coolest games in one of the worst. I used to love playing this game but right now I only want to delete it. I understand your point of view, with all the new games coming up you need money to maintain the game online and so you make partners with third app party. The ads keep you going. But they are losing you players. They are awful, way too many in a way to short period of time (failed level, passed level etc), way too long. 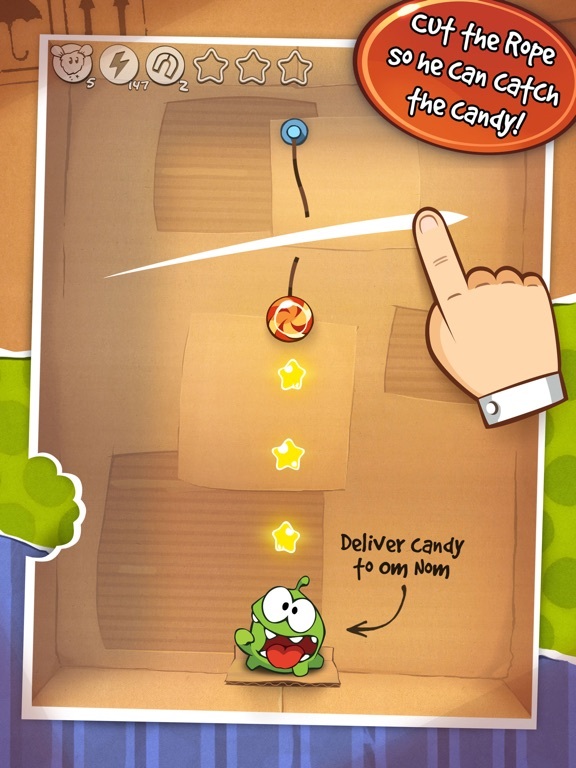 Instead of making this app more of an ads app you should focus on developing a new game of Cut the Rope maybe. I wish you well and please if not remove them at all, make it so that we don’t see that many ads. Thank you ! Still the Best Physics Puzzler! This is a high point for iOS gaming. 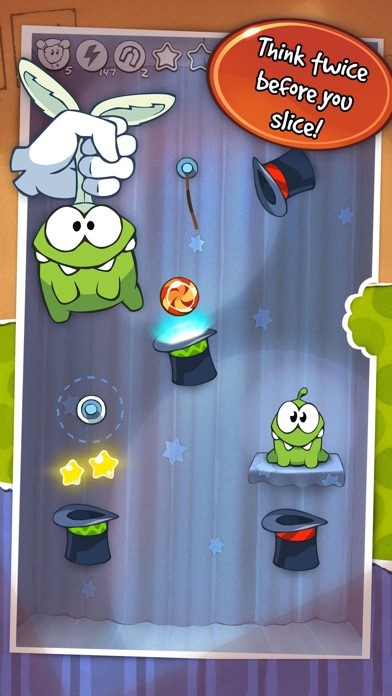 Much better than Cut the Rope 2. In the sequel the physics got much more random, and therefore frustrating. The levels are also more frustrating and exploitative by design to promote in-app purchases. This one though is very satisfying! Excellent progression of learning new techniques to mastering them. You feel like you have control, and definitely has a “one more level” effect. Highly recommended for anyone who wants a fun quick iOS game that highlights the devices strengths. I went on a nostalgia trip and decided it’d be fun to play the game again. I’m completely and utterly disgusted with how many advertisements there are, especially when I distinctly know that there weren’t nearly this many. I played through the cardboard box, noting that the frequency gradually got worse. I can only imagine what it’s like further on. I uninstalled at level 3 of the fabric box. After having an ad in the middle of a level that messed me up and made me lose, which lead to another ad only to have the same happen again I was done. The developers have trashed a perfectly good game by littering it with constant sales pitches and video advertisements. I understand one every so often, but this is insane. I played the game back when it first came out and I had really fond memories of playing it. Thought I’d download the app again and play through all the levels and just stopped after the first 6-7 challenges because there are seriously way too many ads. And it’s not just that there a lot, they’re also super long (~30 seconds each) and some are interactive so you can’t close it down without having to actually play attention to them. If you download this app, you’ll waste more time dealing with ads compared to actually playing. It wasn’t like this at all a couple of years ago. Seriously, don’t download, so not worth it anymore. It doesn’t even deserve 1 star. Like a ton of other people have said I used to play this game growing up. I loved it so I decided to redownload it. There are WAYY too many ads. A level might take you 15 seconds but after you are forced to watch a 30 second ad, or you make a mistake and wanna replay, 30 second ad. Ads should be woven in such a way as to not disrupt the flow of gameplay. Another good trick would be to have people watch ads to get extra perks. However Cut the Tope is a simple game, the ads are way too much for the setup. I’m deleting this game. Which is very sad. Hopefully it’ll get better. The ads CAN be “turned off”! The Ads are, yes, RIDICULOUS! There’s one like every levels, their like a minute long and you can’t exit out of them...BUT YOU CAN TURN THEM OFF! Just put your phone in AIRPLANE MODE! The game won’t be able to connect to the internet, therefore, no more annoying ads! This works with generally any game that thinks putting an ad every 10 secs is a good thing. The overall game is okay. Real good for playing a simple game on the toilet kinda thing. 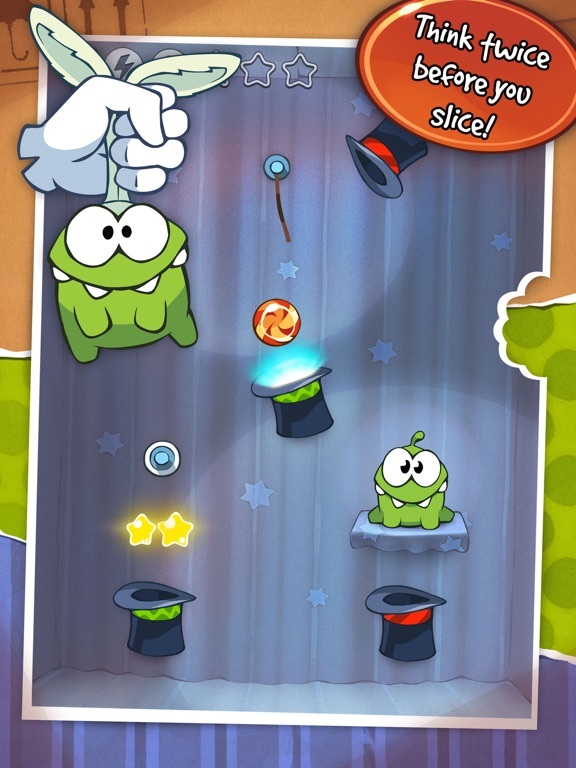 Cut the rope is really fun I think you should get this game because it is just what you need in your life. 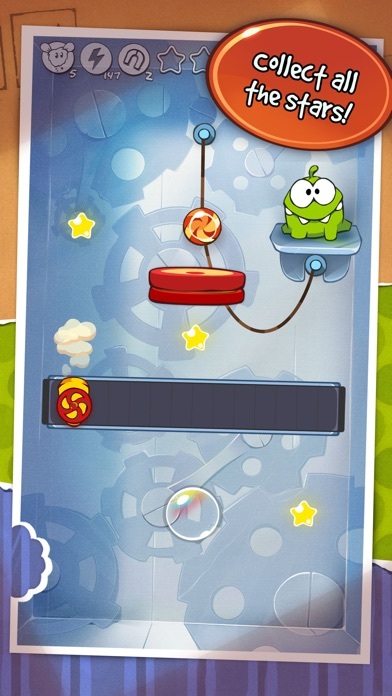 Cut the rope also comes with funny little videos when your tired of playing. Do not think I am a adult I am a kid and this is from a kids point of view. This game is for all ages really. 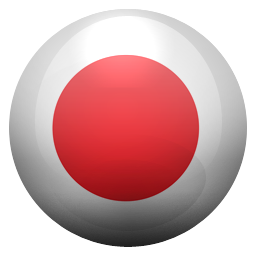 I hope you found this advice helpful and get and like and do a good review on Cut the rope. I love this game. Especially now that it’s free. But there’s just way too many ads. I would say five stars except for the ads. Please make them less frequent. You’d get more ads shown if you make them less frequent, then if you make them appear every 2 seconds and people quit playing the game. Because it’s really getting annoying. As for the game itself, flawless! When I was a kid I played this on my mom’s phone all the time. Somehow it got deleted and I forgot about it until it popped up on Safari. I decided to try it out again, see if it was still the amazing game it was years ago. I haven’t tried it yet, just downloaded it, but I will write a review with different ratings once I’ve tried it out. Great!! I used to love this game when I was young... you know, back when you could play all the boxes and there weren’t any ads. The game itself is highly enjoyable, but all the ads and limits ruin the better parts. To the game developers: please reduce the ads, they come on about every 3 tries. I usually just close the tab and open it again, but it takes a lot of time, and I don’t feel like watching the ad. I loved this game more than life itself as a kid in elementary school, and I decided to redownload it for nostalgic purposes. This game is very fun and takes a lot of strategy but the freaking ads are too much to handle. If you put your phone on airplane mode the ads are mostly gone but still id like to play without blocking out my notifications. The game is still fun and brings back lots of memories, but I’m frustrated with the sheer amount of ads. I used to play this game quite frequently. Now every time I try to play the game an add pops up of course someone has to pay for the games. I almost always have to shut the game down and start back up again because it has locked up after the add. The only reason I have given this game two stars is because I really like the game otherwise it would only be one star because of the locking up after every other level. I love this game so much, and I used to play it when I was young. I got it again because I thought it would be fun to play again, BUT the ads are ridiculous!!!! There’s literally an ad every 30 seconds! It’s so annoying. I get it, you want money, and many games have ads, but I’ve never seen this many ads on a game!!! The ads ruined the game for me, and I don’t feel like playing the game anymore! Yeah I know the game can get frustrating when you lose on a level and keep trying and those stupid ads pop up, but if you turn on airplane mode refresh the game and it play it you will never have ads again! I really love this game because it’s so addicting, but every time you restart a level (which i do often because levels can get really hard), an ad pops up. It gets very annoying to the point where i have to take a break from the game for a day or two at a time. If it had less ads, it honestly would’ve gotten 5 stars from me. An amazing game to pass the time. It's also amazingly well done. Highly recommend it. In the time it takes you to microwave a corn dog and plate it you could already have downloaded the game and started playing this... so the real question is why are you even reading this? Why so many ads ?!?!?!?!?!?! Solid 6/10 overall I would say. Perfect game, nothing could be improved. A+. At least an 85% overall. One of the top 10 games I’ve played, wouldn’t recommend though. 3 standard deviations above average, pretty mediocre I’d say. Perhaps less rope cutting? I am forced to give this game a bad review since they screwed it up so bad. The core game is still fine — it’s a nice combination of puzzle and action that doesn’t force you to be perfect. However, they have unfortunately ruined it with one horrendous change — “Too hard? Get 1 hint” This message pops up after you restart a level too many times for their liking, and they decide to harass you with this dialog. It’s not even clear at first if you can skip it, the UX is so bad. It’s ruined the game for me. I can’t even play 2 levels sometimes without getting stressed out and having to quit. Mobile games have become an unenjoyable joke, and this game is a prime example. I love this game! I have been playing for forever and so many things have changed but it still kept its original feel. One thing I will say is that adds are a big thing for me. I do enjoy add free games but I can handle them.